Springtime Cleaning Can Save Energy and Money! 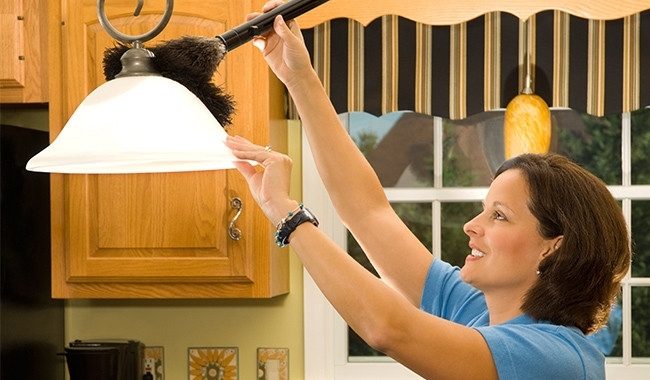 Make your spring cleaning more rewarding with these energy saving cleaning tips. They’ll not only reduce your energy usage, they’ll also lower your bills. So grab a rag and get going! This may not sound worth the trouble, but cleaning dust off the coils in the back of the refrigerator will make it run much more efficiently and save both energy and money. Pull your fridge away from the wall and unplug it. Use a vacuum cleaner to remove dust, or soap and water if it looks really bad back there. Make sure coils are completely dry before replacing plate and moving fridge back. Light Bulbs Need Cleaning Too! Remember to dust or wipe light bulbs, too. Clean bulbs provide more light for the money. If your home has a sliding glass door, keep its track clean. A dirty track can ruin the door’s seal and create gaps where heat or cold air can escape. You can save 5%-15% on cooling costs just by making sure that your A/C filter is clean. This is easy to do, and you should change the air filter in your home 2-4 times a year. Either remove your filter or check it to figure out what kind you need—don’t forget to note how you take it out, so you know how to put it back in. Purchase new one at most hardware stores, and install. Cut the power or unplug. Check around the door to make sure no dirt is preventing the seals from closing. Don’t forget to clean the lint filter every time you use the dryer. Better yet, take advantage of sunny weather and warm spring breezes to dry your clothes outside on the line. Good attic ventilation helps reduce heat buildup, cutting cooling costs and lengthening shingle life. In addition to replacing the filter, schedule an annual inspection for a central air conditioner system. Clear bushes, leaves and other debris away from your outdoor condenser so that it runs more efficiently. If you have any landscaping plans this spring, plant trees that lose their leaves in the fall on the south and west side of your house so that you’ll have shade in the summer and solar heat in the winter. Plant evergreen trees on the north and west sides of your house to act as a wind block and help reduce winter heating costs. If you’re thinking of replacing your furnace before next winter, you may be able to take advantage of end-of-season sales. You’ll still be able to take advantage of your energy company’s rebates.